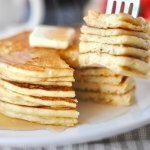 These gluten free pancakes are fluffy and flavorful diner-style flapjacks that truly deserve the title "best ever!" My husband's "secret" recipe rivals any store-bought gluten free pancake mix...at a fraction of the cost! In a separate mixing bowl, whisk together wet ingredients. Slowly incorporate wet ingredients into bowl of dry ingredients, stirring until batter is well combined. A few small lumps are ok.
Heat a flat griddle pan and lightly grease with butter or cooking spray. Cook gluten free pancakes as you would normal pancakes, watching for the surface to bubble before flipping.